PastaQueen (and a friend) review the Pepperidge Farm Baked Natural Cheese Crisps. This is a compensated review from BlogHer and Pepperidge Farm Baked Naturals Cheese Crisps. It was Officer Krupke, in the foyer, with the Cheese Crisps! 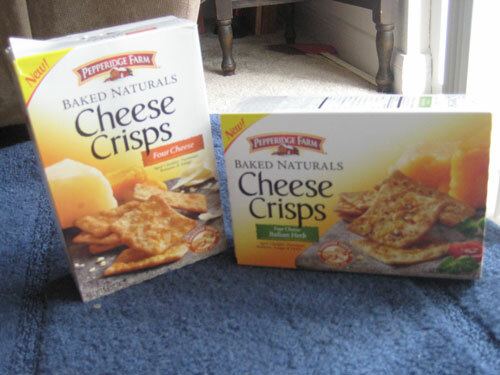 I had received a few boxes of the Pepperidge Farm Baked Natural Cheese Crisps to review, but in my laziness had left the boxes on a table in the foyer as soon as I’d opened them. 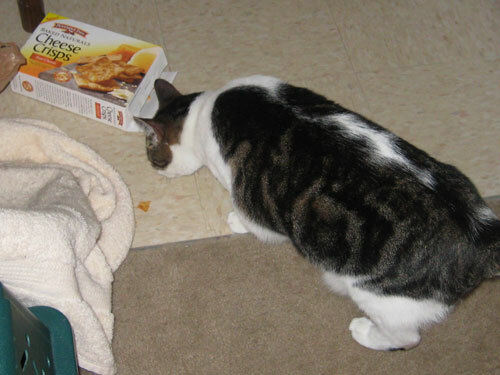 Officer Krupke had knocked the box onto the floor and was devouring the crispy, cheesy crisps as quickly as he could. I stopped to snap a picture and then put the crisps back on the counter. When I returned from putting my camera back, they were at it again! This time Java Bean had joined the fray and they’d knocked at least 3 more crackers out of the box to snack on. This time I didn’t stop for my camera and put the crisps in the kitchen cupboard and crossed my fingers that my cats had not yet learned how to open doors. So, the felines in the Fulda family have registered their opinion: two paws up! My cats are always after my cheese, be it string or ricotta or cottage. If Krupke and the Bean were around, a spider would be the least of Little Miss Muffett’s problems. Nom, nom, nom. According to Pepperidge Farm, the Baked Naturals Cheese Crisps are natural, preservative-free snacks, made with an artisan blend of real cheeses golden baked to bubbly perfection on top of a thin, crispy, crunchy cracker. Four Cheese is made with Aged Cheddar, Asiago, Romano and Parmesan, while Italian Herb is seasoned with flavorful herbs and spices. Krupke and the Bean seemed to prefer the Four Cheese flavor, but I thought both varieties were tasty. They were like a cross between Wheat Thins and Papa John’s cheese sticks. These crunchy munchies are delicious. However, when I eat crackers, I usually find myself covered in crumbs half an hour later, lying on the couch wondering why there is an empty cardboard box on my stomach. I love crackers, but it’s usually better for me if I eat them at a party as an appetizer, where the box is hidden in the host’s kitchen. You can view an image I scanned of the nutritional information here. BlogHer and Pepperidge Farm are giving away a $100 Visa Gift Card. To enter, leave a comment below with your favorite kind of cheese. If you prefer, you can answer the question in a post on your own blog and leave the link in the comments below. The contest will begin on 10/5/2009 and will end 11/2/2009. Make sure that the e-mail address you leave is correct. If you want to increase your odds, visit other BlogHer Reviewers for seven chances to win a $100 Visa gift card. Great contest – my favorite cheese is goat gouda! Or havarti, or chevre… basically any kind of cheese is my favorite. My favorite cheese story. I was at a wedding about 10 years ago and sitting with some people I didn’t know. One of the women said “did you try that cheesecake? It is not very good and so odd that they are serving it before dinner” Yup— it was brie. Personally, I like swiss cheese a lot. Especially the Lorraine swiss with the tiny holes. Yummy! Cheese. My favorite is NY aged cheddar, with an apple. Best. Snack. Ever! Yum, cheese! I’m from WI, it’s practically in my blood! I love cheese… and cheesy crackers! I think I eat cheese at every meal. My favorite is goat or extra, extra sharp cheddar! Mmmm! Hmm, this is tough. I love allllll cheese. I this feta & goat cheese might be my fav. Strong, but not like blue. My fav cheese is cheese. From the stinkiest gorgonzola to a block of velveeta – I don’t discriminate! Brie is my favorite, but almost any cheese will do! Yay, cheese! I love all cheese, except stinky cheese! Colby Jack is my absolute favorite, but that spreadable Winschulers cheese goes great on pepperidge farm crackers! The port wine cheese works great as well! I like cheese but LOVE cheese crackers. I’m not usually a lucky person but what the heck — certainly can’t win if you don’t enter. Hmmm…I think Parmesan, but feta ranks pretty high as well. I’m a fan of mozz myself…..or asiago….yum…….So cute that the kitties liked it! My favorite cheese is stilton…mmmm. Now I really want some cheese! I love colby jack and triscuits. So good and great for an evening snack! My favorite cheese is extra sharp Cheddar! I’m a Swiss cheese gal, myself. My favorite is LAUGHING COW! yummy!!!!!!! Stilton!! the stinkier the better. Although my favorite is Stilton I like all REAL cheese, no processed squares for me please. I would have to say mozzarella is my absolute favorite cheese to infinity and beyond + 2. Laughin Cow’s Babybel cheese is a very close second. Mmmm cheese. My favorite cheese is extra sharp cheddar. So cute when kitties misbehave. If I am just snacking on cheese only, I would have to say colby. The taste…yummy! Italian and WI cheeses are my favorites, but if I had to pick a favorite, I would go with parmesan reggiano! I can’t even tell you how much I love cheese. I particularly enjoy smoked cheeses, so I’m going to go with Smoked Gouda for my favorite. This is subject to change. Always. I like feta, wensleydale, and swiss, in that order. Love cheese. Love crackers. I like things plain and simple. I think sharp cheddar is my all time fav. My favorite cheese is Pepper Jack! My favorite cheese ever is extra sharp cheddar, yum! Sliced with crackers, it’s the best. One of my cats is also a cheese lover. Anytime I make macaroni and cheese, she stalks me until I’m done and let her lick out the bowl. As for me, you can’t go wrong with a good piece of cheddar. I also am a fan of squeaky curd cheese, but you can’t find that around here. I love Gouda! Also Brie, but Gouda more. My favorite kind of cheese is probably brie, closely followed by gouda – yumm! Great contest! I have great fondness for pretty much all cheese, but my favorite for just snacking with crackers has gotta be a very sharp cheddar. Double Gloucester with Chives & Onion! Not sure how I am the first to say this but my favorite cheese is Provolone. My favorite snacking cheese is colby jack, though. Yum. Favorite cheese? How can I pick just one?! I love, love, love sharp cheddar, but I also really like provolone. And Boursin! Holy crap, Boursin!! I’m a fan of real parmigiano reggiano. Good price at Costco! i love provalone at almost a room temperature, it is freaking awesome. :) and i also love crackers, which is why im going to search for these when i go food shopping again (plus i have 3 cats, maybe they will enjoy them too). Ooo I have to narrow it down? Provolone, colby, monterey jack, feta, cheddar….mozzarella…yum. My favorite cheese is cheddar. Yum! It is all good! i do love a runny brie though. My favorites are Manchego and Brie. Yum! My favorite is a tie between Feta and Asiago! YUMMY But I can eat pretty much any cheese, my cousin made Brie with raspberry jam cooked inside rolled out crescent rolls and I thought I had died and went to heaven….but nope I was just in Derry NH. I also love all cheese. My favorite hmm.. Havarti I think. but I wouldn’t say no thanks to many. LOVE the cracker story too – I also identify with the image of you on a couch with the cracker box empty – me too! I should say Brie, since it’s my namesake, but I love goat cheese more. I, too, have two cats who I’m sure would appreciate these! My favorite kind of cheese is basically any kind of cheese! If I had to pick one favorite, I would say an all-purpose sharp cheddar. Parrano cheese. It has a wonderfully sweet and creamy taste to it, but is still a hard cheese. I have lots of favorites, depending on the situation and my phase. But currently I like a nice goat cheese. I love any kind of cheese!!! Yum! I do like a nice aged cheddar, but after hearing Wallace go on and on about a ‘nice Wensleydale’ I’d be interested in trying it. Supposedly before making that cameo in the Wallace & Grommit movies Wensleydale cheese was almost extinct due to lack of interest, but the mention in the movies has revived it’s popularity. Creamy havarti is my favorite cheese! Cheese is my favorite food! My favorite is blue cheese. Yum! I love pepper jack! It’s my favorite! There isn’t a cheese I’ve met I didn’t like. I still love to get cheese curds when we go to Wisconsin. We don’t get them much in the south! Mmm, I looove havarti cheese! It’s super mild, and super soft, so it goes great with just about everything! Especially a yummy honey turkey sandwich with really quality bread… oh great, I just finished breakfast and now I’m hungry again! MMMM, Swiss Cheese is my fave! The Finlandia low fat cheese from Costco is really good (and yeah, contains Swiss). I love St. Andre triple cream! With water crackers or Wheat Thins, yum yum yum. I could eat Boursin until the cows come home (to then make more cheese.) I also love a good Havarti! Hard to pick just one kind of cheese, but overall I would have to say cheddar as I can eat it and use it in many different ways. Manchego cheese, aged at least 12 months. So yummy!! Brie for sure, good spreading cheese for crackers. I’d have to say mine is provolone. Very versitile. Easy on a sandwhich. Perfect in a grilled cheese. and Yummmy with crackers. Although, I’m a huge fan of bleu cheese crumbles on a salad. If I don’t have the extra cals to eat, I’ll stick with feta. I’m so not a cheese snob – my favorite is just sharp cheddar. I will say, though, that I’m a fan of provelone on pizza, and boursin on, well, anything, really. Yum! I love cheese and crackers. I use to have a cat that loved crackers and doritos *smile*. Old Leroy would drive you nuts till he got his share. My favorite cheese is most kinds, though I don’t like the stinky ones. Feta and Cheddar–depending on my mood–wait, who am I kidding…it is dependent on what is available! My favorite cheese is gouda! I love all cheese, but especially a sharp sharp cheddar- yummy! there isn’t a cheese I don’t like, and I’ve often said that I could live happily on just cheese, bread, and chocolate. Mmmmm, cheese. My favorite cheese is goat cheese. It’s so versatile and so yummy!! I am a big fan of Colby Jack cheese, but also love chevre, cheddar, cheese curds, gouda, really anything! I went to college in wisconsin where cheese is practically a religion. I am a cheesehead by birth, so liking cheese is kinda mandatory! My faves are havarti & colby. I trust a cat’s opinion. Dog? Not so much. They are just 4-legged vacuums. I probably shouldn’t have these crisps in my house, because they sound pretty good. Do I have to pick just one? I recently fell in love with Stilton with Cherries! Yumo! I also recently finished reading your book. 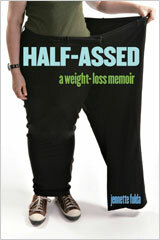 I also read anothe diet blogers book. The two of you were so different and it was wonderful to compare the two viewpoints. Loved your attititued toward working out, working on my own. Sounds like something my Lucy would do. I always have to hide the Cheez-its behind a closed door. Nowhere in the house is high enough to keep her from knocking them down and worming the box open to get some crackers out! My favorite cheese is mozzerella cheese, preferably on a pizza or with pasta, but it’s yummy on its own as well. My favorite cheese depends on the circumstance. On pizza I like fresh mozzarella. I love provolone on a tuna sandwich. Pasta with ricotta is fantastic. Nothing beats a salad with loads of feta. And for snacking with crackers? Hands down, creamy goat cheese. I buy a brick of extra sharp cheddar every single week. Yum. Thanks for the sweeps! Squeaky cheese curds from the Farmer’s Market are great on a Saturday morning! But in Wisconsin any cheese is great! Although I would never turn down cheese, my favorite is the cheeseball that my mom made for holidays. It was just one of those kitschy ones from the 70’s, likely a recipe from a Good Housekeeping or Redbook, full of cream cheese and jarred pimento and roka blue, rolled in pecans for that extra fancy touch. My mom has been gone for 19 years and while I miss her, my little sister has become our family’s resident cheeseball maker. Got to love the provolone, for sure. But fresh cheese curds from Wisconsin are the best! My favorite cheese is Mozzerella!!!!!!!!!!!!!!!!!!! You can put it on bread and melt it to make a little pizza…put it in tomato soup…ahh, I love cheese!!!!!!!! If I had to pick just one it would be sharp cheddar. But really I love them all! My favorite cheese is Lorenzo Lamas. Seriously though, do you think the Pepperidge Farm folks will be a little sad to see you include the words “cat box” in their review? Mmmm…. But, based on the scanned nutrition information, there might be a spot for single servings of these crisps in my sensible diet plan. I’ll check them out since your household approves of the taste. My favorite cheese is sharp cheddar. So good with crackers! You can not force me to pick a fave cheese, I like them all! Pick Me! My favorite kind of cheese is sharp cheddar-but I have had boursin cheese that is breaded and fried-OMG, to die for! So hard to pick just one, but I think Havarti with dill is at the top of the list! I love me some brie. Nom. I can’t enter but just wanted to say FETA IS BETTA! Yummm…cheese…pepper jack is the best! Gotta go with sharp cheddar. My favorite cheese is definitely Manchego, or basically anything sheep’s or goat’s milk-based. Favorite kind of cheese? How could I ever choose? Lately, I’ve been loving goat cheese. I had some really good manchego too. Favorite cheese? Grated asiago mixed into white rice w/ lots of butter. So GOOD. When I was in college, I only ate Kraft singles, until I had a roomate from Wisconsin, who was APPALLED at Kraft Processed Cheese and introduced me to “real cheese” Her mom would send cheese curds that were so fresh they squeaked. So my absolute favorite is squeaky cheese curds, but any kind of “real cheese” is good! I’m pretty plain-jane when it comes to cheese. I like extra sharp cheddar or bleu cheese. Parmesan or gorgonzola, I’m all about the strong flavors. I am a non-discriminatory cheese lover, but I think my all-time favorite is Swiss. It’s almost like a comfort food for me, bringing back childhood memories of getting it as a special treat. I love all kinds of cheese. My current favorites are cheddar, feta and gouda. I love pepper jack! The spicier the better! Oh goodness, how to choose?! I suppose if I had to pick only one type of cheese to eat for the rest of my life, it would be Colby Jack. I know, not very exotic and I do love blue cheese (Especially from Point Reyes) but I don’t think I could handle it ALL the time, only on special occasions. Colby Jack, I can eat some Colby Jack any time! I love Bleu Cheese. Stilton is my favorite to be specific. Anytime I see something made from B.C. I have to try it. Or I have to experiment and make it. Bleu cheese mashed potatoes, scalloped potatoes, pizza, custard….yes custard!! It is divine too. You wouldn’t think so but it really is. I was nominated to make a Bleu Cheesecake, this could be something I will not like that is made of Bleu. I really love all cheeses but if I had to live with only one cheese forever….I would live with Bleu till death do us part. I haven’t yet met a cheese that I didn’t like. If I have to pick a favorite though, it would be creamy Chevre. Yum! My favorite cheese (right now, anyway) is fontina. It is so hard to choose, but I absolutely ADORE Gruyere! Smoked Gouda. If you’ve never tasted any – do so IMMEDIATELY!!! I love Philly cream cheese! Awesome review! I also have cats who are always in trouble for stealing my chips and other crispy treats. Those crackers sound good……maybe I will give em a try! I have very simple tastes and I go for American cheese singles from Kraft. I love all cheese, but Feta is currently #1. I like red leicester cheese – mmmm! Just one cheese? This is hard. Goat! Brie! no, wait, Fontina. This is why I always end up ordering a cheese platter at nice restaurants. Goat cheese. Final Answer. No Lifelines. Stilton! Pepper jack is a close second. My favorite cheese…hmmm…well there are two kinds. Planters Cheese Balls (which have gone extinct) and my cheesey husband. My favorite cheese is gruyere. It is also one of the cheeses with the highest fat content. I love me some cheese! Almost all of my lunches and dinner involve cheese in some shape or form. And ditto for me with the crackers–I have no self-control!! My favorites are extra sharp cheddar and muenster. Yum! Asiago and feta – I love them both! I like all kinds, but I think a good ol’ Cheddar is my favorite. Cheese cheese it’s bad for your heart, the more you eat it the more you feel smart. mmm..i love cheese! My current favorite is definitely parmasean cheese! My favorite cheese is aged irish cheddar – so delicious! Gouda from Trader Joe’s… and fresh mozzarella, feta, chevre, brie…. actually, I’m pretty addicted to all cheese! Cheese… I LOVE cheese. One of my big fears is developing lactose intolerance. I don’t know if I could survive a life without cheese… I adore cottage cheese and there are few things better than a sharp cheddar. Goat cheese is perfection on certain salads and fresh parmesan is divinity on pasta. And for comfort food you just can’t beat a grilled cheese sandwich. Mmm… cheese! I love all cheese, but a slice of Tillamook medium cheddar cheese with crackers is the best. Oh, I’ve been into cheese lately, after a lifetime of indifference. My lifelong favorite, though… it’s a tough pick, since there are only, um, two, but I think mozzarella edges out Parmesan for its sheer meltability. Brie, hands down! With goat cheese pulling in a close second! My newest favorites are Cave Aged Gruyere and Drunken Goat. Brie and mozzarella are probably tied. Cheese is one of the finer things in life. I love goat cheese and reduced fat pepperjack. How can you make me choose just ONE favorite cheese?! I think right now goat cheese is my favorite. I’ve started to put it in all kinds of things. Yum! Those look amazing! parmesan is probably my favorite cheese, but that’s like asking a parent to choose their favorite child. Havarti, all the way. Mmmmm. Triple cream brie!! Oh, ooey, gooey goodness! 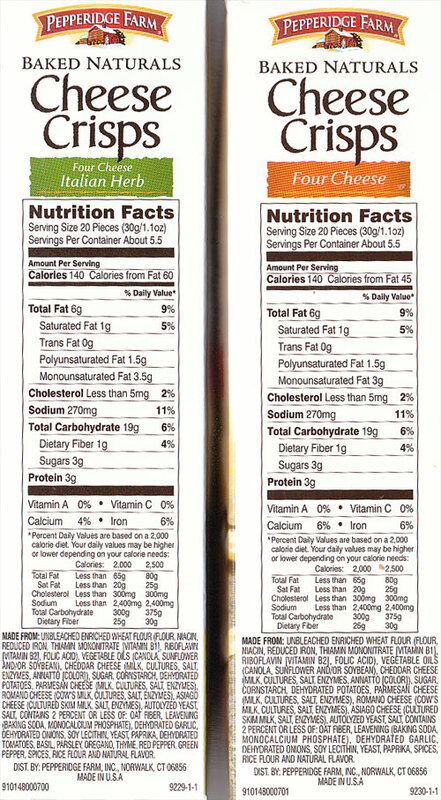 Also love machego and parmesan…..
Any cheese really, but I have to say the favorite is mozzarella. We can pick only ONE cheese? Hmmm. I guess right now, my favorite is feta. At least that’s what I just brought home from the store. Feta is nice, tastes decent in reduced fat versions, goes good in salads, burgers, eggs. I just don’t promise that this is my only favorite cheese! man..thats a tough one..i’ll eat just about any type of cheese..the stinkier the better..but if i had to choose one.. I don’t think you can go wrong with cheese. If I had to pick just one, I’d say colby jack. I love Roquefort cheese, all blue and delicious. I don’t think that this cheese is used enough in american cooking. The crackers look delicious. My favorite cheese would have to be feta, blue and cheddar. Of course, all are good. Great contest too. I love sharp Vermont white cheddar, but I will rarely pass up any kind of cheese. mmmmm….. sharp Vermont cheddar or real Swiss Gruyere? So hard to decide! Feta, baby. All the way. Colby jack, no wait… Tillamook cheddar. Thanks for passing on the gift card. Any kind of cheese is good, except for blue cheese, Medium cheddar from Costco is what is normally in our fridge! Fresh mozzarella (with tomatoes and basil)! Surprise! Pasta Queen was in my Runner’s World Magazine. How ’bout that! brie. my family goes through 3 lbs of brie in two weeks! I live in Amish Country where there are many cheese factories and I’ve tried just about everything there is – and it’s all delicious! If I had to choose though, I’d say Baby Swiss. So creamy. My favorite depends on the day but I love a good parmesan wedge and a knife…mmmmmm…. i love blue cheese! mmmmmm! Hi! Thanks for a great give away! I’m from Wisconsin and my favorite kind of cheese would have to be mozzarella- the cheese of pizzas, chicken parm, pasta… mmmmm…. now I’m hungry! It depends on what I’m eating…blue cheese on a salad, provolone on a sandwich, cheddar cheese by itself, Laughing Cow Garlic flavor on a cracker. It’s hard to choose just one. Hmm, there are so many cheeses to choose from. And different cheeses are best for different things. I’ll go with sharp cheddar right now though, because I’ve been craving it. Yum! So do the compensated reviews go with the freelance financial status? It’s a tie – mozzarella and smoked cheddar. Feta! It’s so good on so many things! I especially like it in a salad with chicken, black olives, and some greek vinaigrette. Mmmmm…. I so love cheese but try to stay away from it. (ya, right). I love a good cheddar or a good colby jack. I’m boring, I don’t need all those “fancy” cheeses. The crackers look good, thanks for a great contest! My favorite is one I have only had twice in my life. A baked brie en croute. I love a good sharp cheddar. It seems almost too ordinary but I am what I am. Nothing too groundbreaking here: I like Muenster. It’s very salty and has an orange rind. LOL that’s too funny that the cats were so “into them’!! No, not really. I’m fond of smoked cheddar, sliced on cracker. Mmmmmmm. I love all things cheese and all things crackers…so much that my husband must keep our cheese flavored crackers under lock and key…. I love cheese. My parents went to London for their 40th anniversary and asked what we wanted them to bring home, and OF COURSE my response was – CHEESE! They brought home the most amazing sharp cheddar . . . THAT is my favorite. But shh. . .don’t tell the customs people. Pepperjack. Definitely pepperjack. The hotter, the better. I’m lucky that I’m a poor law student and that it is a little pricy. I can (and have) eaten a Costco sized brick of that stuff in the space of three days. My motto is “It’s betta with feta!” I love feta cheese! Boring old cheddar! I love the stuff. I LOVE extra sharp cheddar! I also LOVE cheddar mixed with mayo,pimentos and a little salt yum pimento cheese. Make a sandwich using white bread with chips and a sweet pickle. Very Tasty! Favorite cheese is such a hard (and awesome!) question. I have to go with Vermont sharp white cheddar. I enjoy some mozeralla with salami and crackers. I have always been partial to processed cheese but have given it up. Now I like swiss, and love pepperjack. Love the picture. That is to funny. Wow – I’d have to say smoked Gouda. No! Wait! Sharp cheddar. Or maybe goat cheese. Argh, it’s too hard to pick just one! OK, fine, goat cheese. Phew! I adore brie. A little too much. My favorite is sharp cheddar, though pretty much like all cheese. Smoked. Sharp. Cheddar. Yeeeeaaaaah, baby! And feta. Feta is the bomb-diggety! OH and string and cottage and ricotta, though mainly in lasagna form. I love it all, it’s like chosing a favorite ice cream! I love all kind of chesses but my really favorite are Feta, Smoked Gouda, Smoked and Baby Swiss. Parmesan is my favorite- but it has to be a block of the really good stuff, not the fake crap in the green can. My favorite cheese is swiss cheese, which is odd because when I was a kid I hated the sour taste of swiss cheese. I think that our taste buds change as the years pass! I once had an appetizer of goat cheese served on a date or fig. It was at a potluck and it was SO GOOD!!! Several people raved about the taste combination. Unfortunately I could not find the person who brought it to find out what kind of goat cheese it was. Yum, a really big chunk of good blue cheese! I love all cheese but I would have to say my favorite is cheddar. Brie…though pretty much any cheese in any form! I LOVE fresh mozarella cheese! I prefer it melted over just about anything. I’m high on Parrano lately. I like almost any kind of cheese. It depends on my mood or what’s available. I likes me some provolone. Does cheese in a can count? No?…. Mozzarella. I tell people my youngest child was made of mozzarella and sweet tea, since it was just about all I ate for the 42 (yes) weeks I was gestating the girl. Seriously, what’s not to like about cheese? I like cheese. . . I like crackers. I might have to try these! I loooooove mizithra. It’s delicious on pasta. Feta, gouda (especially with dates), and of course string cheese of all kinds. Cheese is way too popular at my house. No. The final answer is farmer’s cheese. I love all cheese. My favorite? Smoke gouda. I love cheddar! My mom used to slice little pieces and give it to us when she was making salads with dinner. YUMMY! I love cheese. These days, I’m favoring romano–it’s handy in a lot of recipes. Oh dear, I don’t like cheese — unless you count cheesecake covered with cherries and Better Cheddars – ha! My husband is the cheese lover in our family – he keeps several varieties in the fridge or freezer — Parmigiano-Reggiano, Mozzarella, Feta, Gouda, Cheddar, Blue Cheese, and others. In fact, he’s just purchased items to try his hand at making his own. Hard to pick just one, as I LOVE cheese! I’ll pick Muenster cheese. I love extra sharp aged white cheddar. Why add dye to make it orange? Oh, and I snigger at American cheese. I always think of it as a food-like product. I like so many kinds of cheese! I used to have a penchant for colby/jack, but lately my favorite has been pepper jack. Love that zip! The cheeses I don’t like would make a much shorter list. Lately I’m all about reduced-fat cheddar, of course. But with an unlimited calorie budget I head straight for the brie. Feta in salads. Muenster or Havarti on a turkey sandwich. Baked rigatoni with melted mozzarella and parmesan. Gouda with fresh fruit. And that Greek cheese that they set on fire in Greek restaurants. Yum. If I didn’t have children to cook for, I would very likely live on cheese and crackers. Favorite cheese? Oh I love cheese so I can’t choose just one. I love feta, munster, cheddar, swiss, provolone, mozz, goat, and on and on. The one I probably eat the most is reduced fat string cheese (mozz I guess). warmed Brie is the best! Feta. Or maybe cheddar. Or mozzarella…. oh, man, now I’m hungry! Cheeese…mmmm! My favs are colby and brick. Hmmm … I’m in the throng of cheese lovers that find it hard to discriminate! However, if I have to pick, I guess I’d say either blue cheese or goat cheese. Yum! Gee, I wonder why I am still in Weight Watchers? My favorite kind of cheese is Muenster. It’s deliciously smooth and melts wonderfully. Well, here’s another “healthy” snack, eh? 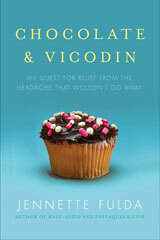 Upscale junk food is still, sadly, just that – JUNK food! Bought some cheese recently from a farmers’ market which was Curried Cheddar and it’s now my favourite. :o) It’s so tasty, you only need the tiniest amount. I have to admit that, although I love cheese, I haven’t actually tried many varieties. Of the three varieties I buy most often, cheddar, monterey jack, and mozzarella, I’d have to say I appreciate good ol’ cheddar the most. Can’t go wrong with cheddar. Fetta is my fav… I can eat it on anything. Mozzarella…on anything! Or, straight from the brick! My favorite type of cheese is Colby Jack. Simple but so so so yummy! When I was growing up, there was a locally owned diner in my small town that was open 24 hours a day. On the weekends my friends and I would go out dancing and end up at this diner. Every week I would get the same thing: fries and feta cheese. It is deeeelicious! I love Pepper Jack cheese. It’s great for using in dips. I LOVE LOVE blue cheese-hate the smell-love the cheese! My favorite cheese is an Oak Smoked Cheddar from the Isle of Man. It sounds exotic, right? Cheese from a wee tiny island between Scotland and Ireland? Yeah – you’d think so – but apparently they have enough cows there to manufacture it and distribute it through COSTCO! Who’d’ve thunk it? Inexpensive AND tasty! I adore Dutch gouda and Asiago. Asiago makes everything more tasty! I love all cheese!! Funny in 1985 when I got married we received not 1, not 2, but SEVEN cheese servers. You know with the board to cut and serve cheese and the dome to cover it?? I know some of you are probably too young for that! haha I love cheese but more apt to eat it off the brick in front of the fridge that serve it in a dome! I think my favorite all time is brie but also love bleu. My fave cheese is Wensleydale with cranberries or blueberries. To die for! My favorite cheese is mozzerella on New York style pizza! This is a very touch choice for me — I am a total cheese addict! In fact, my favorite cheese changes often. At the moment, I’m really into Monterey Jack. Thanks! For cooking I love fontina. For eating it’s smoked gouda! My cats and I all say MANCHEGO! Our very favorite cheese. Now if someone would only make a smoked Manchego, I could die happy. I love all cheese except very smokey flavored ones. I love the asiago crackers. I love cheese! A good dry aged Jack is my all time favorite. Well, I wish I was like Wallace and could say my favorite was Wensleydale (just because it sounds cool), but I think I’m going to go with Raclette. It’s a cheese and a way of life! You get it and get a raclette grill and have dinners where you melt little personal pans of the cheese to pour on steamed veggies and potatoes. The racks also have a grill top for onions and thinly sliced meat. Mmmmm! Too many….can’t pick! I am particularly fond of sharp or strong cheeses; from horseradish cheddar to herbed goat cheese to brie to provolone…I even like lindberger! Sadly, I cannot stomach any blue cheeses. Not sure why. That’s easy. Parmesan Reggiano. Aged 24 months. To. Die. For. PROVOLONE! Nice smokey provolone – not too hard, not too soft, not too spicy, not too bland and it even melts nicely. Yeah – that’s my fav. Smoked gouda with sun dried tomatoes….I love it with wheat thin crackers! I am now wondering if I buy these I have to keep them in the cabinet so my cats dont try to steal them! Mozzarella! Any kind of it. I just love the flavor (or lack thereof, really.) It is mild but I really like mild food, so it’s perfect! My fav is Havarti… soooo delicious! Thanks for the chance! My favorite is the Laughing Cow herb triangle wedges. It’s easier to tell you what kind of cheese I don’t like, blue chees. Oh how I love thee parano. Close second: anything super smelly. My fave kind of cheese is Swiss Cheese! My favorite cheese is gouda for straight up snacking but cheddar for cooking. love brie and goat’s cheese! Like many others who commented I haven’t yet met a cheese I didn’t like. Many of my faves bring back memories associated with them – Edam & Gouda eaten fresh from the markets in the respective cities in the Netherlands, Baby Swiss from one of my all time favorite places in the Alps of Switzerland, Ementhaler used in delicious fondue had in Switzerland, Squeeky Cheese Curds from my college days in upper northeast corner of Iowa, and the list goes on. Also love Parmesan, Mizithra, Mozzerella, and Blue Cheese Crumbles. If I had to pick a favorite or one bought most often, I would have to pick Muenster (Monster Cheese :-) as it’s know in my family) – makes the best grilled cheese sandwiches. Have been on a cheese and crackers kick lately so will definitely have to try those new Pepperidge Farm crackers too! My favorite cheese is muenster! Our fav cheese is drunken goat cheese (wine soaked goat cheese). Mmmm. We love cheese in all forms in our house! Extra sharp cheddar is our favorite for munching, and blue cheese or feta crumbles for our salads. I LOVE Cheese…ANY kind of cheese…I even will eat slices of cream cheese by itself. But I have to say my favorite is blue cheese. Sorry kinda boring but I love Colby! I am nutty about cheese. Love cheese and peanut butter (not together) more than meat. Eat some of both everyday. I cannot think of a kind of cheese that I do not like. I must not have Brie in the house because I have no self discipline, so maybe that is my fav. That’s a tough one, I LOVE cheese! But my favorite is probably brie! Or Munster!! Mmmm, cheese! Bree on a toasted baquette! My favorite cheese at the moment is Blue cheese crumbles mixed with wilted spinach and spaghetti!YYUUUMMMMMYYYY!! But a nice creamy brie on some apples is probably a close second! My favorite cheese has to be mozzarella…although I love most cheese. Cheese, any cheese, is good but a soft gouda would rank way up there. Thanks for the giveaway! My favorite cheese is white cheddar — tangy, sharp yet smooth. Yum! I like good ol’ cheddar. Yum! Pepper Jack cheese is my favorite! I love spicy foods. Muenster for sandwhiches, and blue cheese on everything else. My favorite kind of cheese is soy cheese- specifically Follow Your Heart Gourmet Monterey Jack! Thanks so much for the opportunity! I really haven’t tried too many crazy cheeses but I love Mozzorella slices! Tough question, but my favorite cheese right now is brie. Mmmmmm. Cheese. My favorite cheese right now is creamy goat cheese. Delicious on salads. My all time favorite is brie! I’m a huge feta cheese fan – I can eat a whole tub of it – I don’t, but I certainly could!! Smoked swiss is my favorite cheese, and hard to find. Smoked swiss cheese crackers would be fabulous! I love ALL cheese, too much. But I have come late to loving the Bleu cheese. I wouldn’t touch the stuff for 40 years, then I tried it, and Love Love Love IT! Mmmm cheese. It’s hard to pick just one. I’m thinking just sharp cheddar. My favorite cheese is feta. I really like many cheeses, but I think my favorite is extra, extra sharp cheddar. truthfully i’m not a fan of cheese at all but I love me some almond cheese! Fave cheese? Raw vegan cashew cheese that I make myself and season it with red peppers! ooohhh cheese…quite possibly the perfect food. i don’t play favorites, but more often than not i reach for the pepper jack. mmmm…brie is definitely my favorite. great contest! My favourite… Pepperjack! Followed closely by Sharp Cheddar, Monteray Jack, and Parmesan! Will Twitter, Facebook, and link this giveaway back to my blog! Thanks for the chance to enter and win! I tweeted:By @ butterjessfly PastaQueen is having a giveaway! http://bit.ly/1aQd4v ending 11/2. Love Blue Cheese & your blog. Goat cheese is hands down, my favorite!! My favorite cheese is baby Swiss. Can’t get enough!! Provolone is my favorite cheese. Ooh–goat cheese crumbled over a spinach salad! I love cheese, it is hard to pick one favorite. I especially like extra sharp cheddar, but I’m also a big fan of pepper jack. Mmmmm, I love Cabot cheddar cheese. I have it every night for snack… delicious! I think my favorite cheese is cheddar? Maybe provolone? Or mozzarella? Parmesan? All of the above! Really is there any bad cheese? I pick Brie! Mmmmmmm, brie cheese! I like gouda with cumin. I love cheese, and I even did my undergrad in Wisconsin, so I’ve tried some yummy cheeses. And I love cheese curds! Anyone who hasn’t tried them… you must. My favorite cheese is goat cheese. It is good in ANYTHING EVER! My favorite cheese is anything by Cowgirl Creamery – especially Mt. Tam! I also love cambozola. and a good shropshire blue! favorite cheese? Ohh that is tough! I love really sharp cheddar. And I like it to be firm. My husband likes it mild and squishy. Ew. Thanks for the contest – I think I have to go with a good sharp cheddar, although freshwater mozzarella is right up there. So is Bulgarian Feta, and French Feta. I love Dutch Gouda cheese! Back in elementary school, my friend would bring in homemade bread with slices of Gouda every day for lunch. I’d trade her a chewy bar for a piece of bread and cheese every day! Hmmm, I come from a cheese loving family, my mom always said we needed to marry cheese factory owners and my brothers 1st birthday cake was a square of Melrose cheese with a candle. I love all cheese, but buttermilk blue is my favorite. Vermont cheddar is almost as good. And feta is almost as good as Vermont cheddar! I have actually started eating Sheese which is great for me when I want something cheesey that won’t upset my tummy! Great giveawway! My favorite is pepperjack cheese! My fave cheese is feta! My favorite cheese is pepper jack. I tweeted the contest! (From my account @RawJuiceGirl – I left the status link but was told I left spam so I thought I’d try to post this way. I love any kind of cheese! my favorite is chevre though.